Jaw opening of 5 inches. The Sealmaster Magneta thermal impulse sealer is an economical choice for sealing PE film up to 10 mil. The sealer can be operated by hand or with an optional foot pedal for hands free operation. It features a hold-on device which securely holds the film during sealing and cooling. The cutter allows you to make bags of any length directly from the roll of polyethylene tubing. The bag is cut off the roll while the bottom seal is made. Sealers have timers for both sealing and cooling. Jaw opening of 5 inches and sealing lengths of 16-1/2 or 24-1/2. 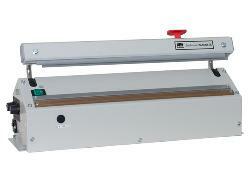 Workshelf which can be fitted on the sealer in 5 different working positions. 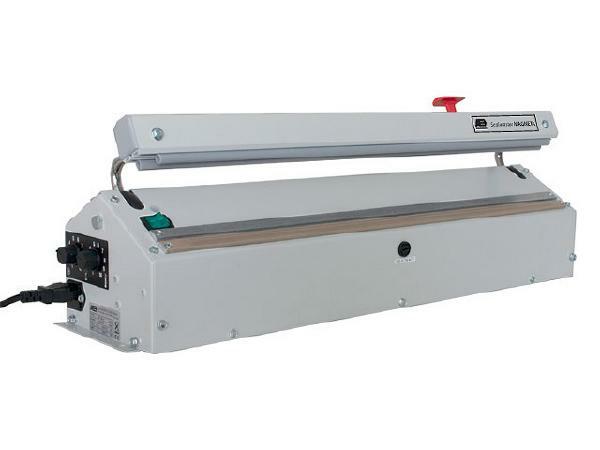 Rolloflux is positioned behind the stand to allow bags to be made from a roll. Rollers allow handling of tubing. Adjustable Bag Support provides support for the article to be packaged. Footpedal Stand for foot operation. Polylock Attachment holds film in position so it will not fall when tubing is cut. Bag Holder allows easy manipulation of bags. Many other sealers available - call your representative for additional information.